I READ a lot of stat sheets prior to writing these articles but the reason for Samoa’s win against Wales won’t be found on any of them. You can’t measure it and you can’t count it on the field of play. Barring Jamie Roberts, the Samoans simply hit harder than Wales. Much harder. In a modern game awash with complex defensive systems and running patterns, rugby remains simple, sometimes you just have to smash the man that’s standing in front of you – and that’s what Samoa did. Their clearing out at the ruck was devastating and their tackling was of the sort that you can hear as well as see. It is worth noting that as impressive as Samoan’s physicality is, the lack of the use of ‘arms’ in the tackle area is of genuine concern for player safety – should ‘Head and Shoulders’ be looking to sponsor a rugby team, the Samoans are the perfect fit. Wales were beaten in virtually all aspects of the game. Wales would have expected to struggle at the breakdown and to lose yardage in the tackle, yet they wouldn’t have expected to struggle at the set piece. On first glance Wales’ lineout numbers look good – they had a completion rate of 86.7%, winning 13 from 15. But good work from Samoa’s middle jumpers, particularly in the first half, forced Wales to use front ball as their default option. Front ball is fine for rolling mauls and setting box kicks, but it is not an ideal platform from which to release your backline. Wales’ scrum also became increasingly fragile over the 80 minutes. After an admirable start, the Welsh scrum melted in the last quarter and created a succession of penalties for the visitors – the last four scrums of the game each resulted in Wales conceding a penalty. Losing in the contact area to Samoa is one thing. Losing the set piece is altogether more worrying. Wales once again failed to score a try – they did of course score a try, but an interception doesn’t really count. It is a very worrying statistic for Wales. Up until the Argentina game Wales had scored at least one try in all of their previous 21 Tests. They now haven’t crossed whitewash in their last two. What’s more concerning is that they aren’t only failing to finish opportunities, they aren’t creating any. 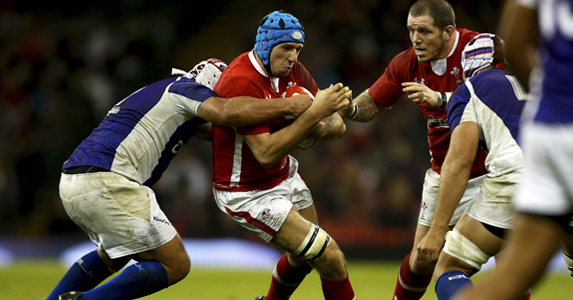 Wales’ passing against Samoa was highly inaccurate. Numerous passes were thrown behind the receiver and often stunted their ability to move the ball wide. Wales also seem unable to work an overlap. Lateral running lines, an inability to hold a defender on the inside shoulder and an infuriating compulsion to stick Garryowens up around the halfway line meant that Wales only made one clean break – and that was Ashley Beck’s interception try. In fact, Wales butchered so many overlaps at the Millennium Stadium that it was like sitting in an abattoir – there was plenty of claret on show too. Jamie Roberts is a wonderful defender. He is Wales’ defensive captain and his tackling is the cornerstone of their defensive patterns. However, if there’s one very minor criticism of his defensive work, it’s that he often doesn’t tackle his weight. For a man of 6ft 4inches and 17st 4lbs he hits ‘big’, but rarely puts in ‘big hits’. This was not the case against Samoa. His tackling was thunderously impressive. Jamie only made seven tackles in the game but they had the same impact as making 14. It was powerful. It was agressive. It was effective. Hell, it was Samoan. Over the past five years Wales have been obsessed with ‘closing the gap’ – the gap in quality between themselves and the Southern Hemisphere teams. Well, the gap is closing. But it isn’t the gap at the top of the rankings; it’s the gap at the bottom. Wales may have beaten Samoa on their previous two meetings but it was by a combined total of just 11 points. Samoa have beaten Australia away from home, they very nearly derailed Wales’ World Cup campaign and have now beaten them in Cardiff. On Friday evening, Samoa had more territory, made more offloads, and ran further with the ball in hand. Samoa had a better ruck and maul percentage, conceded less penalties, conceded less turnovers and of course scored more tires. In fact, the gap isn’t closing. It’s closed, at the wrong end for Wales.